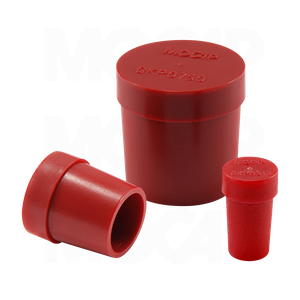 MOCAP General Purpose Plugs for Type L and M Tubing are designed for applications where the outside diameter of the plug should not exceed the outside diameter of the tubing. The plug flange fits flush with the outside wall of the tubing. Protects tubing from moisture, dust and damage during production, shipping and storage. Our GKP Series Plugs are moulded in Red polyethylene plastic and sized to fit Type L & M Tubing from 3/16 thru 3/4. Many Sizes of Our General Purpose Plugs for Type L and M Tubing are Stocked for Immediate Shipment.